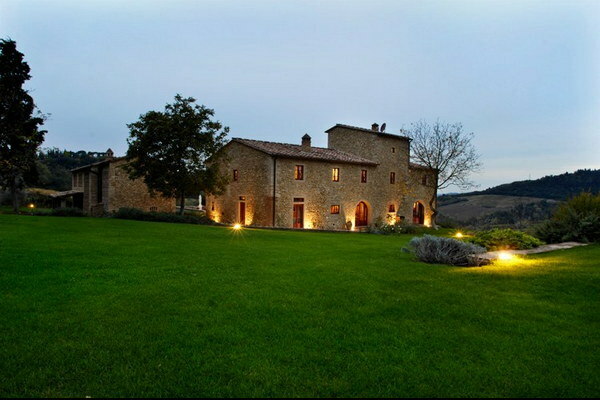 Villa Semifonte has the good fortune to be located among the most stunning scenery in Chianti. Just a few kilometers from the classic hill town of Barberino val d'Elsa, this beautiful villa offers cozy and stylish accommodations for a group as large as twenty-four guests. For this reason, it is frequently used for family reunions, wedding and gatherings of friends who want to experience the best that Tuscany has to offer. It has recently been restored in a manner that elegantly preserves the traditional Tuscan character in harmony with modern amenities and conveniences. In the nearby hills, the proud city-state of Semifonte once existed, with a thriving community. Built in the eleventh century, it was destroyed following a siege by the Florentines in 1202 and the little that remains can be found in the vicinity of the villa. The estate consists of an impressive country house that can sleep up to sixteen guests (8 bedrooms/8 bathrooms). Surrounding the property is a large panoramic garden with well furnished terraces and pergolas offering lovely views of the vineyards and rolling countryside. The private swimming pool is 8 meters x 16 meters with a maximum depth of 2.3 meters. The pool also has an attached child's pool which is 8 meters in diameter. The pool area also has a dressing room, sauna and bathroom. The villa offers air conditioning and WIFI Internet connection. All of the bedrooms are equipped with satellite TV. There is a covered parking area large enough for eight cars. A baby bed is available at no charge and upon request there are cooking lessons, baby sitting, breakfast, lunch and dinner service available. There is a nice facility for laundry and ironing. There is a separate annex for up to 10 additional guests, which is only open when rented together with the main villa. It is never rented separately. Click here for a description of Villa Semifonte + annex, for up to 26 guests. Villa Semifonte is only 3 km from Barberino val d'Elsa. Florence and Siena are each about 40 km and San Gimignano is 19 km. Large living area with satellite TV, accessed from the large terrace. Down two steps there is a dining room with fireplace and access to the outside. The well equipped kitchen includes two ovens, dishwasher, freezer, grill, ice maker, microwave and storage room. Two steps down there is a twin bedded room (beds can be joined) with en bathroom (shower) and outside access. This bedroom is very handy for elderly guests and for those preferring a ground floor due to walking difficulties. Stylish living area with satellite TV and access to four double bedrooms and two twin-bedded rooms (beds can be joined). Each bedroom has an en suite bathroom -- three with shower, one with bathtub and two with Jacuzzi bath. Double bedroom with en suite bathroom (shower). Upon request: Baby sitting, cook services, transfer, extra maid service, laundry.